The team of Magic Carpet Cleaning strives to justify the highest expectations for cleanliness of our customers from Hanwell W7.Our professional carpet cleaners are fully insured and certified. If you dream your residence, office or property of any kind to be cleaned please contact us at 0208 861 0979 now! Why Choose Magic Carpet Cleaning in Hanwell W7? Innovative cleaning methods we use are in line with the latest trends from our professional field. We avoid using harmful chemicals because we care about your health and the environment. Our company policy is oriented towards providing clear relationship with our customers. You can be sure there are no hidden fees or charges. Even old dirt does not have a chance with our teams. We offer a full guarantee in carrying out cleaning services for our clients! We are ready to clean and re-clean until we are sure you are happy with the result. Our 24/7 support team is always ready to help you by answering all your questions. For all people in Hanwell W7, the recommended method of washing is Steam Carpet Cleaning, especially if you are allergic to dust or have children and pets. The hot water extraction has proven to be one of the most effective treatments currently used in the cleaning field. This approach uses the power of hot water and steam to kill germs and achieve maximum results. Our carpet cleaners inject detergent under high pressure with the help of our specialized machines. Then, they vacuum up the dirt with steam. Our professionals are trained to work both in homes and offices. Dry Carpet Cleaning is a professional cleaning method loved by customers who need cleaning services in commercial buildings. The lack of water and steam makes this cleaning approach unique and highly effective. It is also very fast and you don’t need to wait for the treated textile floor to dry. The delicate fabrics are protected from mold and the life of your rugs is prolonged. Compositions in powder form are rubbed in the fabrics and are then sucked out together with the contaminants. The dry compound we use consists of 98% biodegradable substances and protects the environment. The natural and synthetic materials as well as blemishes from all origins are not a problem for our professional cleaners. Coffee, traces of pet urine, wine, food, chewing gum, chocolate, etc. will disappear without a trace and will not bother you anymore. The Magic Carpet Cleaning teams undergo specialized courses and use state-of-the-art equipment which guarantees 100% efficient work. 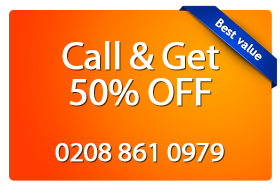 Trust our professional team and call 0208 861 0979! Don’t give up! Purity and shine can come back to your life thanks to the Magic Carpet Cleaning team Call them at:0208 861 0979 and book an appointment now!